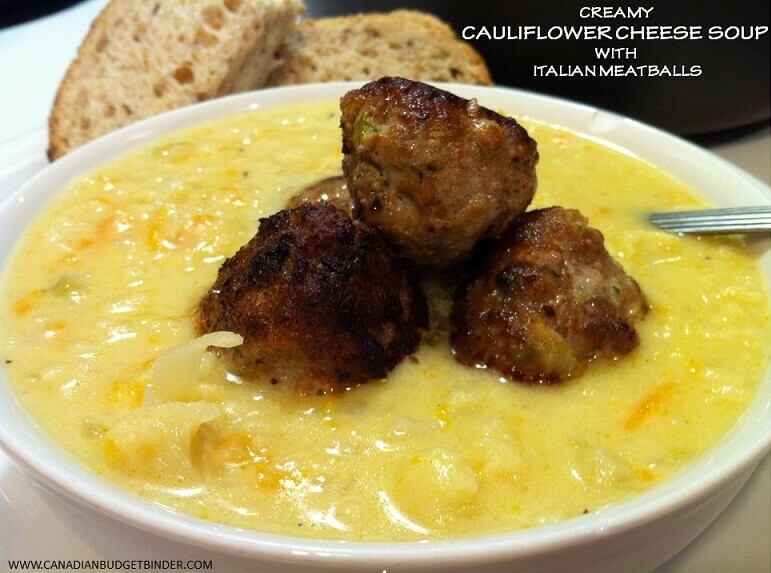 Move over chicken noodle soup I have a cauliflower cheese soup that will hit the spot and it’s topped with Italian meatballs. Cauliflower is one of those vegetables that are underrated and most people use it for veggies and dip but you can make so many gorgeous recipes with cauliflower. You can buy cauliflower that is white, orange, green or purple but you’ll pay more for the unusual coloured varieties. Cauliflower can be eaten raw, roasted, mashed, boiled, fried, steamed and baked and is low in carbohydrates which makes it perfect for low-carb diets such as the Atikins diet and is used as a substitute for potatoes and rice. I can hardly tell the difference when we make cheesy mashed cauliflower compared to mashed cheesy potatoes. Come October my soup radar starts going off especially as the nights get colder and we start to crave meals that are comforting. I happened to buy a massive cauliflower for $0.99 and needed something to do with it. I typically love making baked cauliflower loaded pizza and baked cauliflower with cheese but came up with this creamy Cauliflower Cheese Soup recipe that I know you will love. I made my vegetable broth for this cauliflower cheese soup with vegetable scraps and then added in chicken Knorr cubes to boost the chicken flavour. The best part is there are hidden vegetables in this cauliflower cheese soup like carrots, celery and onion so if you have any picky eaters they won’t even know it’s in there. Cheese trumps all!! I also added in lots of old cheddar cheese however if you have a favourite cheese you’d like to use you can easily substitute it. Finally, I added fresh ginger, Worcestershire sauce and a few dashes of Franks Red Hot Sauce for flavour. Don’t worry the soup is not spicy at all as Franks is more of a vinegar based hot sauce with more tang than anything. On top of this gorgeous cauliflower cheese soup I added a few Italian Meatballs that I fried in some extra-virgin olive oil. You can find the recipe for my Nonna’s meatballs already posted on the blog as it has been a very popular recipe over the years. When I make pasta sauce I tend to cook them from raw in the sauce but if I want to enjoy them cooked right away I simply fry them up and they are delicious. They give this cauliflower cheese soup that full meal touch. 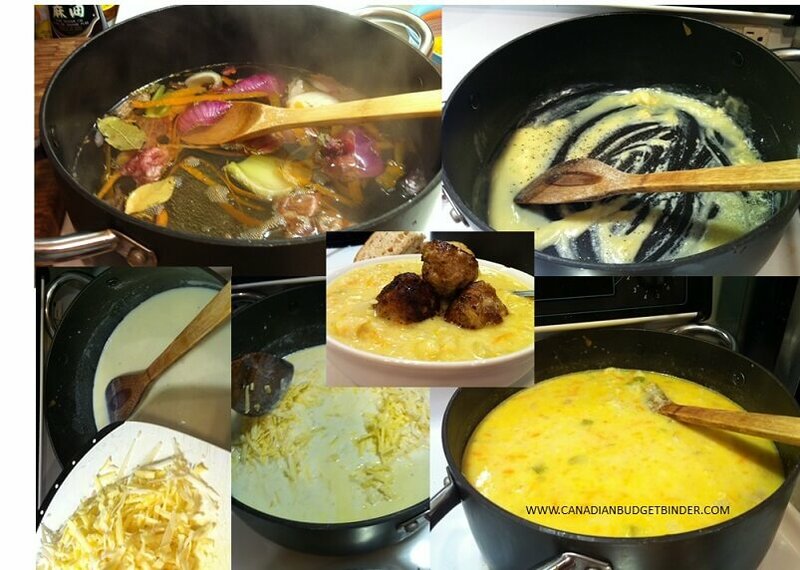 If you don’t care for the meatballs, leave them out and enjoy the cauliflower cheese soup as it is. If you are a soup lover and can handle lots of cheese you will go wild for this super easy cauliflower cheese soup that is very budget-friendly. In a large stock pot add the water and your vegetable peels and bay leafs. Boil for about 20 minutes. If you use the onion peel you may have a nice golden vegetable broth. On medium heat add in your chicken cubes, celery, onions, carrots, cauliflower, fresh ginger, minced garlic, Worcestershire sauce, Franks Red Hot Sauce (optional) and bring to a boil then reduce for about 20 minutes or until all the vegetables are tender. In another pot, melt the butter to make a roux for the cheese portion of the soup. Once the butter is melted add the flour, salt and pepper. Add in your milk a little at a time while constantly stirring over medium heat. Cook the roux until it thickens (few minutes) and coats the back of your spoon. Add in your 2 cups of cheddar cheese and stir. Taste to make sure salt balance is good for you. With your hand blender puree the vegetables but keep some chunks of cauliflower for texture. Add in the cheese sauce and mix. If you want to add Italian meatballs I put 2-3 on top of each bowl. Sprinkle with Parmigiana cheese if desired. This pot made 12 portions of soup. The pot of soup made 12 portions for us but only allowed me to put cups in the above recipe. If you are feeding adults this recipe would likely only make 4-5 large bowls of soup. This cauliflower cheese soup is fine in the refrigerator for up to 4 days but you can freeze it for later use. I portion my soups into containers so they are easy to heat up in a saucepan. Soup is the perfect go-to meal when you are on the run and when we were new parents because the last thing we wanted to do was cook every day. I hope you enjoy this amazing soup and let me know what you think. Looks tasty!!! I’d likely pull some stock from my freezer to cut a little time off things. Cut back a little in the amount of stock and I could have some fun fudging this recipe into something baked that didn’t have the veggies puréed quite so much…. I can be as bad as Mary for changing a recipe as I make it!! Lol!! Mary D said she tried this recipe today with broccoli which would work just as well but I haven’t tried it yet. I might buy some broccoli this week as it’s on sale at Food Basics and try it out. Yes, you can cut down the time with your own broth if you have it. I use up the peels to make a veggie broth if I can.